Sponge Cake. No. 4 12 ounces sugar 6 ounces flour 12 eggs - a little rosewater or lemon juice. Beat the yolks & whites separately & thoroughly. Sponge Cake. Mrs. Morris No. 5. 1 cup sugar 1 cup flour 1/2 cup cold water 2 eggs 1 teaspoon cream tartar 1/2 teaspoon soda - add flour last. Coffee Cake Mrs. Eaton. No. 2. 1 cup butter 1 cup strong coffee 1 cup molasses 1 egg 1 nutmeg & 1 lb raisins 1 teaspoon cream tartar 1/2 teaspoon soda - slow oven & bake a long time. Mrs. Morris's Cake. 1 cup sugar 1/2 cup (small) butter beaten to a cream, 1/2 cup sweet milk 2 cups flour 2 egg whites well beaten 1 teaspoon cream tartar 1/2 teaspoon soda. Jelly Cake. Mrs. Bradish. No. 3. 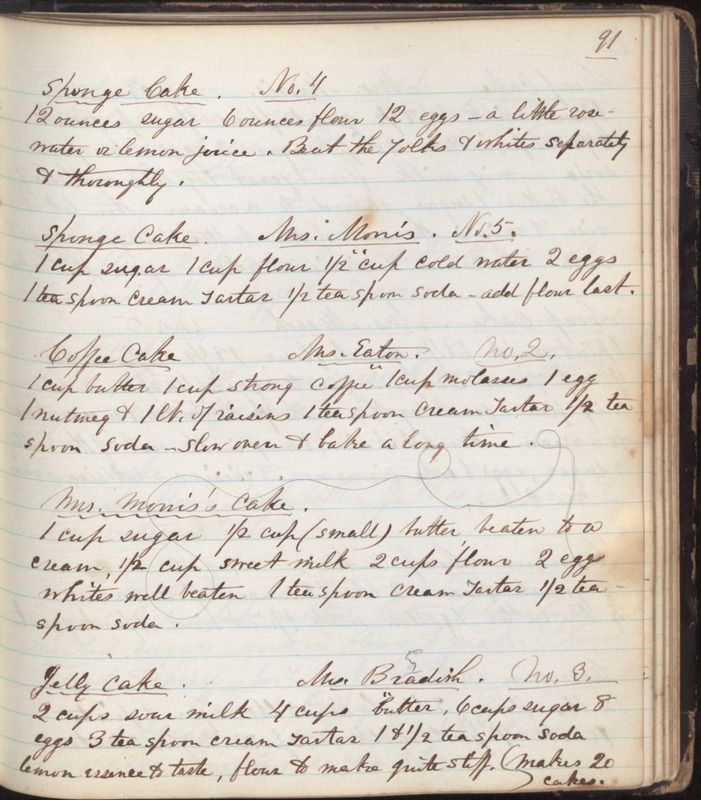 2 cups sour milk 4 cups butter, 6 cups sugar 8 eggs 3 tea spoon cream tartar 1 & 1/2 teaspoon soda lemon essence to taste, flour to make quite stiff. Makes 20 cakes.